Lee McCaulla was born in Memphis, TN in 1969, the oldest of three children. Growing up in the Bartlett suburbs, he discovered art, created stories, and tinkered with stage magic. When an early episode of Mister Rogers introduced him to something called a flipbook, he became captivated by the illusion of "drawings that moved". Inspired by the works of Shel Silverstein, Florence P. Heide, Charles Schultz, Dr. Suess, Jim Henson, J.R.R. Tolkien, Jules Verne, Walt Disney, C.S. Lewis, Gene Roddenberry, and H.G. Wells, Lee just kept making stuff. His talents were soon recognized by his teachers. In addition to drawing, writing and acting out stories for his classmates, Lee would go on to win school yearbook cover design contests: first in 1980 during his 5th-grade year at Altruria Elementary and again in 1982 during his 7th-grade year at Shadowlawn Middle. Comic books were central pre-occupations of his youth. As the films of Spielberg and Lucas continued to dominate the box office, Lee became even more inspired. And in the summer of 1983 he discovered Don Bluth's arcade hit, Dragon's Lair. The game made a powerful impression on him, opening his eyes even wider to the art of animation. At Bartlett High School, he was heavily immersed in the arts. Here he excelled in artistic, theatrical and choral work while continuing to experiment with film/video production. It was also during this time he came to learn of Cal Arts - the private Disney art college heralded around the world for its renowned animation program. In 1986, Lee was accepted into the Tennessee Governor's School for the Arts - a statewide summer program for talented high school students. He ended up turning it down, however, to spend the summer making his own movies instead. His 1987 "swan song" at Bartlett High became the school's first Senior Video - a project highlighting significant events and pop culture throughout of the final year. Today, Senior Video is offered as an elective course at Bartlett that allows students to receive credit towards their graduation requirement. After high school, Lee enrolled in Memphis State University (University of Memphis) as a theatre major, minoring in film. A year later he took time off from school to focus on various part-time jobs; saving money in pursuit of his dream to attend Cal Arts and become a professional animator. He remained active in the Memphis theatre community, eventually finding work as an actor alongside William Sanderson (Newhart, Blade Runner) for a Fred’s Dollar Store commercial and also as an extra in the film Heart of Dixie, starring Ally Sheedy and Virginia Madsen. In the spring of 1989 he was accepted into the Cal Arts character animation program - a lifelong dream come true. During his Cal Arts experience, he was selected to intern at the Walt Disney Studios where he trained with other artists under Disney "greats" like Walt Stanchfield, Glen Keane, Rick Farmiloe, and Dan Tanaka. Lee would later train during Pocahontas production under the guidance of his Cal Arts mentor Chris Buck (Frozen, Tarzan) and Lori Noda (Great Mouse Detective, Oliver & Company). A recipient of the Lew and Edie Wasserman Scholarship, Lee graduated with his BFA in film/video from Cal Arts in 1991. As an artist, he would contribute to such films as Disney's Aladdin, Pocahontas, Warner Bros. Space Jam, Ferngully: The Last Rainforest, and television shows such as The Ren & Stimpy Show. Under the direction of Darrell Van Citters at Renegade, Lee animated on television commercials for Dow Scrubbing Bubbles, Cocoa Pebbles cereal, a Japanese Esso spot starring Lupin the 3rd, and on the Disney/Sega Genesis game, Gargoyles. In 1996, Lee found himself directing a team of artists at Warner Bros. on his own animated short, Loose Tooth. The film went on to win awards at festivals around the world, appeared on Canal Plus TV in France and qualified for Academy Award consideration in 1997. Shortly thereafter, he was hired by John Krisfalusci (Spumco) to direct a series of Old Navy commercials. The retro-styled spots went on to win Spumco the Annie Award for Best TV Commercial of 1998. Torn between pursuing a master's degree in experimental animation and returning to work for the studios, Lee met with Jules Engel - founder of the experimental animation program at Cal Arts. Surprisingly, Jules encouraged Lee to start his own company instead. To minimize risk, Lee returned to Memphis and launched Creative Forces, Inc. - a whiz-bang start-up that allowed his entrepreneurial skills to grow. While building the company, Lee accepted a tenure-track faculty position at State Technical Institute (Southwest Tennessee Community College), where he taught motion graphics, animation, design and multimedia for five years in the Graphic Arts Technology program. It was during this time as an independent filmmaker and college instructor, that he helmed various film projects such as Paper Clips (a CGI short for the internet), Worker's Compensation (a live action short for Adaptec), Taxi Ride (a music video for Tori Amos), and Streaker (a low-budget independent feature film). During the economic crisis of 2006, he experienced a series of significant life changes which opened the doorway to a deeper journey within. His production company, Creative Forces, was officially dissolved in 2008. And after four amazing months living in a Buddhist temple, Lee returned to Los Angeles. In 2009, he completed a Master's Certificate at UCLA in Producing (Film & TV). In addition to his many artistic endeavors, Lee worked for three years with Apple Computer in sales, training, and troubleshooting. He received the Apple Product Professional Award in 2008 and was mobile device certified by Apple to repair iPhones, iPods, and iPads. Eventually becoming one of the company's top salespeople, his experience with Apple sharpened his customer service skills while bolstering his grasp on technology. Some of Lee's hobbies include yoga, meditation, investing, improvisation and holistic nutrition. If you look closely, you can spot him on a few episodes of the hit TV series Mad Men and in Clint Eastwood's Jersey Boys. 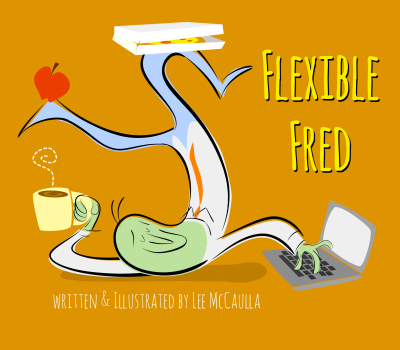 Flexible Fred is his first work as a children's book author and illustrator.